Why Choose Chemistry as a Major? Chemistry is often described as “the central science” because it plays a pivotal role in controlling structures and properties of matters in sizes from atoms to bulk materials. Chemists are scientific frontiers and industry leaders in numerous areas, including energy, environment, medical, materials sciences, solving global issues for 21st century. As a Chemistry Major, you are becoming a chemist and exploring the following opportunities. Chemistry track in UNIST holds an event, namely “Chemistry Night”, twice a year (spring and fall semester) to have a casual meeting time for both professors and undergraduate students. At this event, students get fruitful information about what students can do in case they major in chemistry, which courses Chemistry track offers, what kind of researches professors in Chemistry track do in their laboratories, and so on. 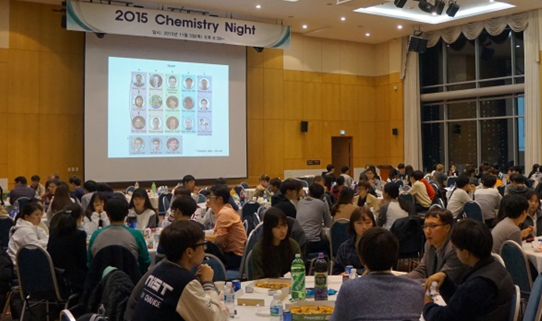 In fall semester this year, Chemistry track held a very successful“Chemistry Night”event. More than 15 professors and more than 120 undergraduate students (mostly freshmen) attended at this event and had a nice time to know each other.